Good branding is important both for big companies and small businesses. Branding makes products and companies memorable, attracts customers, and in the end, it increases the value of the company. Branding is a process of creating company’s name, logo and visual elements that will help customers to more easily distinguish one company from another. Building brand identity is a part of the branding process. Brand identity is how a company wants to be perceived by customers. That’s why business owners need to decide what impression they want to make on customers. Also, they need to know who is their target audience and what are the values and the message their product will carry. Companies can’t know for sure what impression they will make on the customers, but they can create different visual elements of the brand identity that will help them to be perceived in the way that business owner wants. Key elements of every brand identity are logo, packaging, business cards and uniforms. These elements represent the company and its brand and they need to be coherent. If a logo is designed in one way all other elements should be designed in the same style. That means that one unique combination of colors, fonts, and shapes used for creating one brand identity element should be used for every other element. Inconsistency in elements’ design could produce confusion among customers and they wouldn’t be able to associate the product with the brand. Furthermore, different shapes, colors, and fonts create different image for the business. That is why when creating a design for brand identity, business owners need to have in mind the industry they run their business in and the characteristics of their target audience. Brand identity helps consumers to relate and connect to a brand. When customers share the same values with a company and perceive company’s brand as reliable and trustworthy they will more easily buy their product. Strong brand identity makes your business easy recognizable and consumers can effortlessly distinguish you from the competitors. That is especially important for new, small businesses when they want to stand out in the crowded market. It will help you attract new consumers, but also develop loyalty with existing ones. Also, introducing a new product to the market audience will go smoothly when customers can associate the new product with already established brand identity. Company with powerful brand identity has powerful reputation. That reputation brings companies strong business partners. Moreover, good company reputation will attract great employees. Since powerful brand identity brings many benefits to the business, it should be wisely created. The process of brand identity creation should be planned well and carried out carefully. Building brand identity can be time-consuming and sometimes challenging, so it is always good to know what to do first during this process. 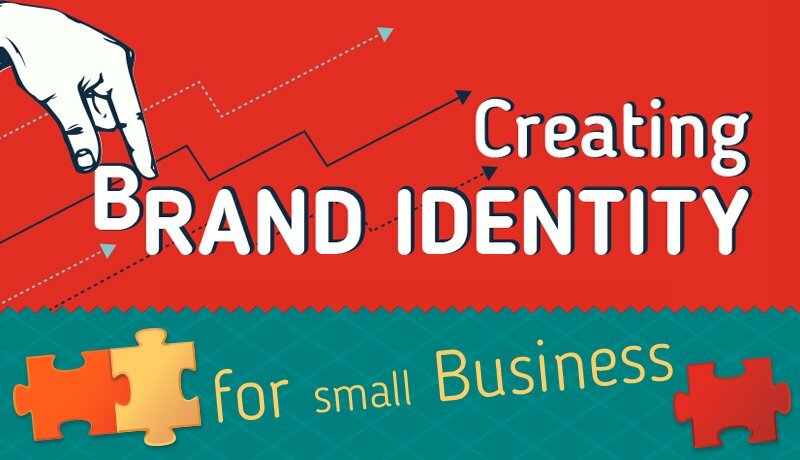 To better understand how to start creating your brand identity, check out the following infographic. It will give you an insight into the brand identity creation process along with some useful designing tips.